At the end of 3 months, patrons rotate out to another site or, after 24 hours patrons can call and make reservations for another 3 months. 12x26 pad and one picnic table. $17.00 night, 14 day stay maximum. One picnic table 12x26 pad. 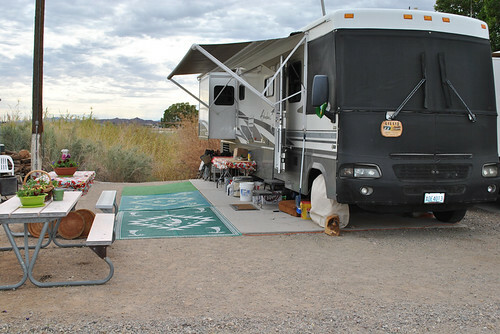 RV Sites: $15.00 per night, except major holidays. No discount for long term stay (10 short term sites-2 week) and (10 long term sites- 3 month) Includes electric and water hook-up. Patrons are responsible to clean their area before departure. Nearest dump station is 2.5 miles away at Fisher’s Landing. RV sites (or Prim #1, #2 and #3) have built in bar-b-q grills. We want your stay at Lake Martinez to be the comfort of home with all the beauty of Lake Martinez. For more reservation information, please call 928-269-2262 or 928-269-2267.